Height 5,07 cm, length 33 m. From the Umayyad residential winter palace of Qasr Mshatta, 30 km south of Amman. The Mshatta Facade, which is a portion of the 8th century Umayyad palace of Qasr Mshatta, was excavated in the Jordanian desert during the 19th century and offered to the Emperor of Germany by the Ottoman Sultan. It is an incredible piece of cultural heritage, but the reasons of my attachment are very much personal. Once upon a time, thirty birds decided to go on a journey to find their God, the Simurgh bird. They traveled long and far, and many died on the way. Only three of them remained when they finally found the Simurgh. He then revealed to them that the exact meaning of his name was, in fact, "thirty birds." The birds realised they were only searching for themselves, all this time. Seeing the Simurgh in Berlin shortly after I had left Syria resonated with me. I felt like just the birds; having gone through a long journey only to find a piece of myself at the end. I hope other refugees can find similar comfort, in the museum or elsewhere. Accepting to leave behind your home and everything you thought your life would be is extremely tough, but maybe this is the journey that will lead us to ourselves. 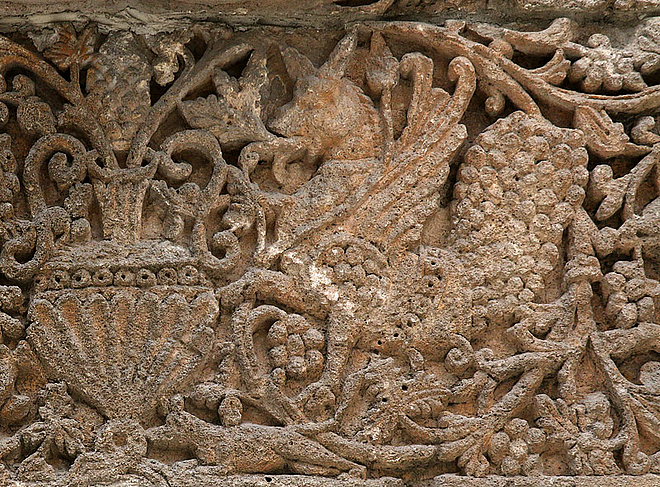 The decorated part of the facade of the Umayyad residential winter palace of Qasr Mshatta. Excavated up from 1840 about 30 km south of the Jordanian capital of Amman. The building of the palace probably dates to the era of the caliph Al-Walid II (743-744). After Al Walid was murdered, it was left incomplete and later ruined in an earthquake. The facade was a gift from the Ottoman Sultan Abdul Hamid II to Emperor Wilhelm II of Germany. A large part of it was brought to the then Kaiser-Friedrich-Museum (now the Bode Museum) in Berlin in 1903. It was reconstructed as a 33 metres long, 5 metres high facade, with two towers, and parts of a central gateway. Since 1932 it was exhibited in the Pergamon Museum. Today, it is one of the most important exhibits of the Museum of Islamic Art Berlin. Completed her BA in visual communications at AIU Damascus in 2014. She arrived in Berlin in 2016, where she works as a museum guide at the Museum of Islamic Art for Multaka. 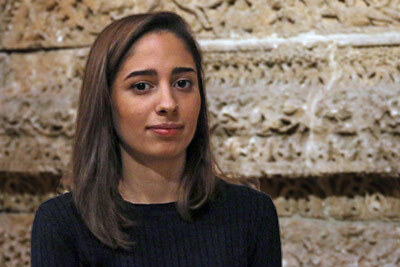 She is also an assistant at the project Religion and Refugees at HU Berlin and an independent filmmaker, who participated in the Venice Biennale 2015.